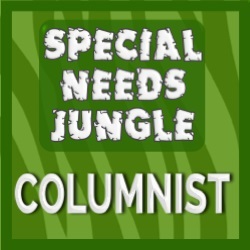 This is part of a series of posts on phonological awareness (listening to sounds). 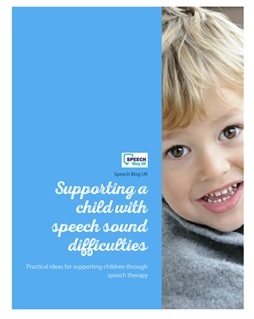 This is a really important skill when working on speech sounds. You can read our other posts on auditory discrimination and rhyming. Today I’m going to focus on identifying the number of syllables in a word. Children who tend to miss out syllables from words when they are talking (eg they might say “ephant” instead of “elephant”. Children whose speech is generally unclear or mumbled. Children who are struggling with literacy (although I am not going to talk about this in detail today). Children who need extra support to learn new vocabulary. Talking about the sounds and syllables in words can be one useful way of helping them to remember new words. 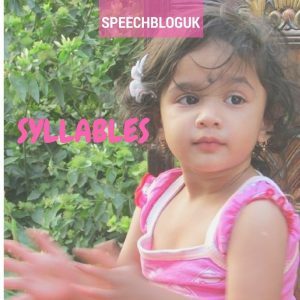 Syllables can be a tricky thing to explain to a child. When I first start working on it, I usually tell the child that we are going to “split the word into bits”. I often ask them to see how many claps it has. Children who are in school often try to start spelling the word, and splitting it up into each individual sound. Usually the best way to get them to understand what we are doing is to demonstrate. I usually start with my name as an example. I say “My name is Helen. How many claps has that got?” Then I clap it and say it slowly. “He…len, it’s got two claps. Can you clap that one for me?” Then I move on to their name and the names of other familiar people such as siblings or their teacher. We clap them out slowly together. Get them to tap the syllables instead. They could tap a finger on the table for each syllable. For some children, this is easier. Ask them to manipulate objects instead. For example, have a selection of small bricks on the table and see if the child can touch each one or move it across the table as they say each syllable. This last activity is also good for children who find it hard to know how many claps they did! Lots of children find this hard too. They can clap out the right number of syllables, but then when you say “how many syllables has it got?” they don’t know. They can’t count as well, while clapping and speaking. When you think about it, we’re asking them to do 3 things at the same time, it’s hardly surprising that some children find it a challenge! For these children, giving them something visual to help count the syllables with really helps. For example, I might let them clap it out but put one finger up each time they clap. Then they can count my fingers at the end to see how many syllables the word has. This also helps children who struggle with the co-ordination of clapping. Alternatively, you can use objects as I mentioned above. Finally, some children find clapping syllables difficult because they are not saying all the syllables when they say the word. For some of these children, once they have got the idea of syllable clapping, just the act of clapping it out will help them to add the missing syllable/s back in. However, for many children they will just clap it the way they say it (eg they might say “nana” for banana and clap twice). For these children, I usually say it first for them to hear. To begin with I will both say and clap the word and they can copy. Later on, I will just say it and see if they can copy the way I said it and clap the syllables themselves. You don’t really need a lot of resources to clap out syllables – it’s easy to just use people’s names or clap out the names of objects around you. Don’t forget to include some one syllable words (such as tree or cup) as well. These can sometimes be the hardest for children to clap out. However, it can also be nice to use pictures to do this with too. I found some lovely free syllable cards on this blog. The article also has some other nice ideas to use if your child finds clapping hard. The peg cards on the blog are really nice. They would be great to use in a group – each child can put their peg where they think it should go and then you can compare. As a 1:1 activity, you and the child can both do it and then you can compare. What other activities do you use to work on syllables?